Quo Vadis is something of an institution on the London restaurant scene. It first opened its doors in 1926 and has seen Marco Pierre White amongst its owners. It now belongs to the well-known restaurateur brothers, Sam and Eddie Hart, who also own Fino and Barrafina. Much noise was made about the glam factor and kudos that the brothers brought to the restaurant when they purchased and refurbished it in 2008. Now, noise is again being made about the arrival of Chef Jeremy Lee who was previously at the Blueprint Café and was responsible for its well-received cooking for the best part of 16 years. The glam factor has not dissipated since Lee’s arrival and the décor still has that same classy, elegant feel to it. But the menu seems less fussy than the food that I ate during my previous visit (for that post, click here). It makes for a scrumptious read and offers good variety, with a pie and braise of the day, small bites and sandwiches, grills and a range of à la carte options. The theatre menu, which is available all day, has been designed to beat any recessionary blues with two courses at £17.50 and three courses for £20. 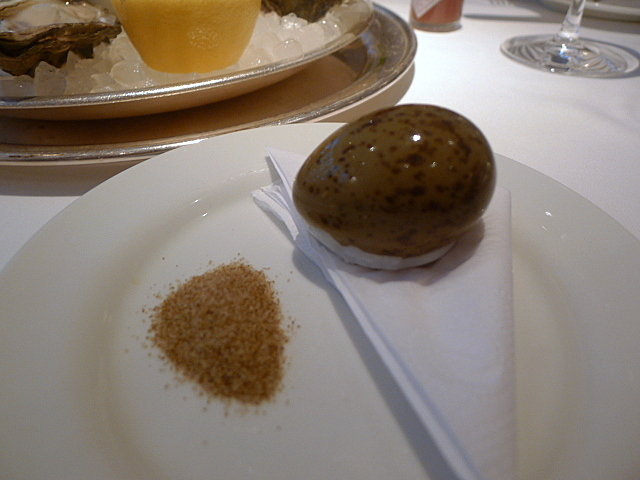 To kick start my meal, I couldn’t pass up the chance to try a gull’s egg. These eggs are available only during the spring and have an incredibly short season of about 3 weeks. The egg had been perfectly cooked and was runny to accentuate the richness of its lovely yolk. The accompanying celeriac salt worked well with the egg. 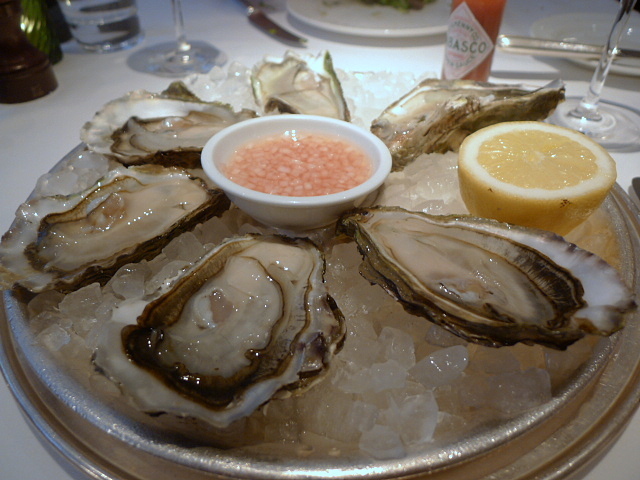 Also for starters were six rock oysters (£12.50) which were fresh and delicious, and rich with an irony flavour. 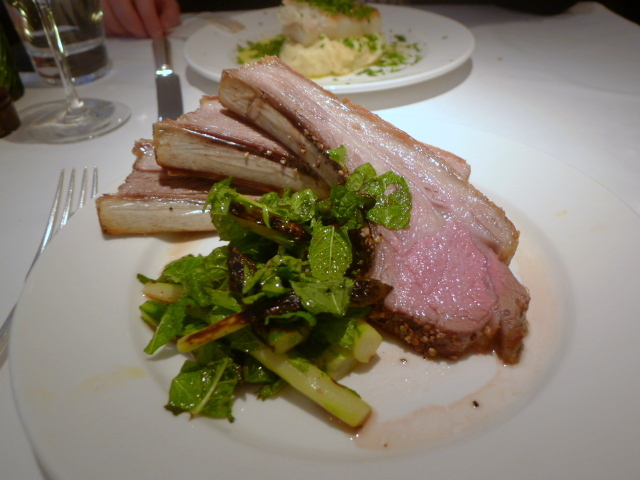 Rack of lamb (£21.50) was quite fatty, far too fatty for my liking, but was nevertheless extremely tasty. Char-grilled asparagus with mint accompanied the lamb and was glorious with its aromatic charred effect. 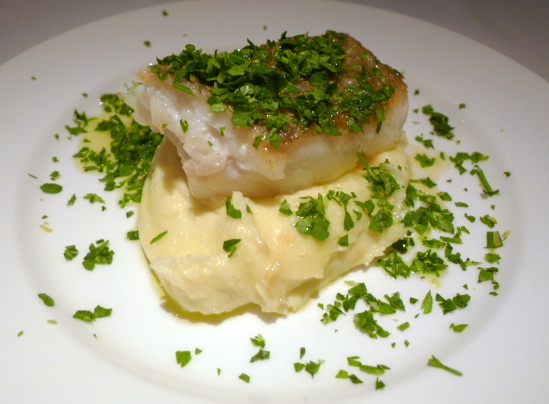 Pan-fried cod (£18) was beautifully cooked with a scrumptiously crispy skin. Olive oil mash was gloriously smooth and creamy and dressed with a smashing gremolata made with lots of aromatic parsley. 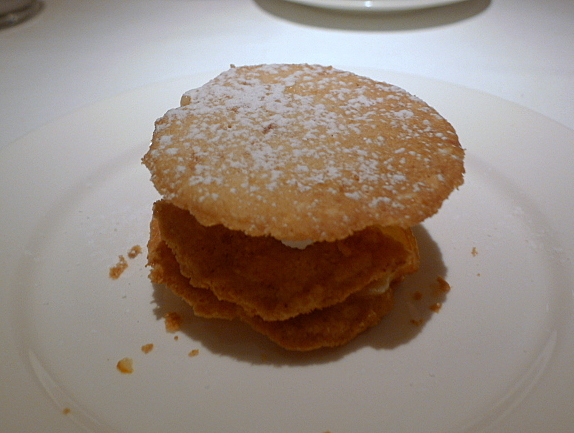 A dessert of shortcake, goat’s curd, lemon curd and marmalade (£5.50) included layers of very good shortcake that was buttery and crunchy. But there was not enough lemon curd between the layers to give the dessert the zing that it needed to balance out the goat’s curd. The marmalade was also slightly bitter. 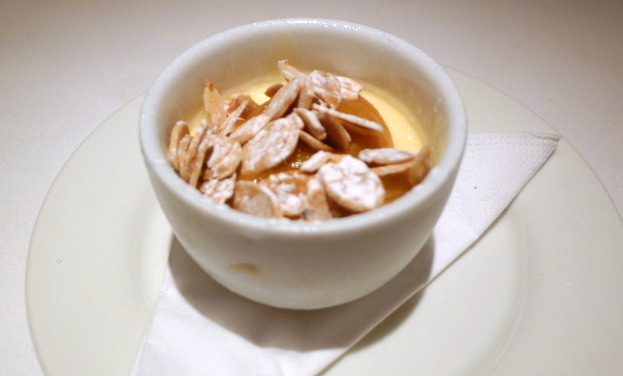 Lemon posset (£5.50) with loquat (a Japanese plum) was creamy and lovely. The dessert was finished with some almond flakes for a crunchy textural effect. This was a simple yet refined meal which demonstrated great skill and finesse. The dishes were simply constructed, but the wonderful ingredients were treated with respect and put to careful use to showcase a good marriage of flavours. I would have put in a few tweaks here and there, but on the whole, this was a lovely meal. The décor is elegant, although some might perhaps find it a little stiff and posh. But if class is what you’re after, then Quo Vadis will do very well. And if the theatre menu is anywhere near as good as the food I ate on this occasion, then it would make for fantastic value for money. Price range: £25 – £40 for three courses. Excludes drinks and service.